Whether you live in New Mexico or New York, Virginia or Vermont, Connecticut or California, TEXAS READY has an heirloom seed bank especially designed to grow in your region! The Piggy Bank is recommended for one or two adults wishing to supplement their diet with fresh, nutritious, truly organic produce. The Lock Box is recommended for up to four adults wishing to supplement their diet with fresh, nutritious, truly organic produce. The Treasury is recommended for thirty adults wishing to supplement their diet with fresh, nutritious, truly organic produce. Enough seed is provided for a year-round garden for at least thirty adult units, along with an excess to hold in reserve in case a particular crop does not do well. USDA trends show an increase in adoption in GE foods. Gluten is a mixture of proteins that occur naturally in wheat, rye, barley and crossbreeds of these grains. As many as 3 million people in the United States have celiac disease. It occurs when the body's natural defense system reacts to gluten by attacking the lining of the small intestine. Without a healthy intestinal lining, the body cannot absorb the nutrients it needs. Delayed growth and nutrient deficiencies can result and may lead to conditions such as anemia (a lower than normal number of red blood cells) and osteoporosis, a disease in which bones become fragile and more likely to break. Other serious health problems may include diabetes, autoimmune thyroid disease and intestinal cancers. 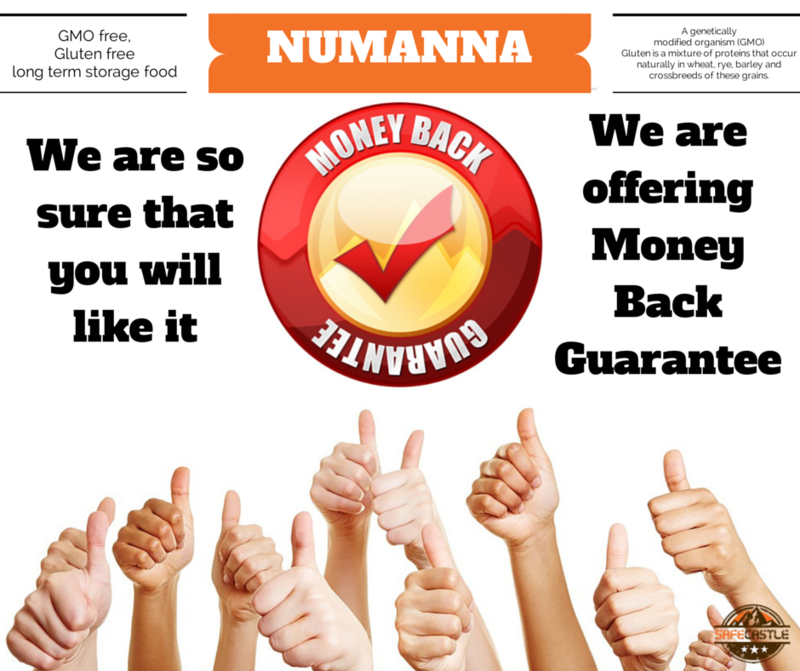 What is Money Back Guarantee ? You don't like it , just send it back !! Labels: camping, food, food shortage, freeze dried food, How to be ready, new products, safecastle, storage food, supply food, survival, Why prepare? This Mask is manufactured by Draeger and conforms to German and other NATO specs. Our full face masks can be used with threaded filters in compliance with EN 148-1 (DIN 3183). This Mask has approval as a Personal Protection Device that falls under category 111 in terms of European standard 89/686/CEE (Leg. Dec. 4.12.92, No 475) The masks carry a CE certification in conformity with the harmonised EN 136: 1998 standard and satisfy the requirements laid down for class 3. 32 oz. bottle of the hospital-approved Sanifect 128 (manufacturer's Materials Safety Data Sheet available upon request) good for 128 fogger refills. The new HAZARiD kit is like no other product available to the public. It provides you with the means to quickly and easily decontaminate biological hazards. Note: Our supplier is overwhelmed with orders right now. Ship date is 2 weeks from order date. Due to high demand out of stock !! You can place orders now so we can secure it for future. The Ultimate Protector Approved by NIOSH and EU and NATO. Suitable from ages 12 and up.This mask has civilian and industrial applications giving protection against any threat. Instantly develops color upon exposure to radiation. The 3M™ 1860 N95 Health Care Particulate Respirator and Surgical Mask is NIOSH approved N95 respirator. Lightweight, economical life-saving water filter. The unit holds up to 3gal./11L of water for drinking and/or washing. To know more on our decontamination products click here. Labels: Decontamination, Ebola, gas mask, new products, Nuclear preparedness, outdoors, safecastle, Safecastle sales, sale, water filters, Why prepare? Looking for a survival seed vault or emergency seed bank...? Each of the seed kit contain over 80 open-pollinated varieties of non hybrid, non-GMO seed all personally selected for the bountiful home-grown production of tasty and nutritious vegetables, herbs, fruits and grains. Texas Ready name refers to a state of preparedness, not a growing region, we offer both a Northern Bank (for Zones 3-6) and a Southern Bank (for Zones 7-12). This complete seed-saving book describes specific techniques for saving the seeds of 160 different vegetables. This book takes raised bed gardening to a whole new level. The New York Times hailed it as "possibly the most detailed explanation of the intensive gardening method available." Labels: Farming, food, seeds, survival, Texas Ready, Why prepare?